The latest #chartonthego demonstrates why muni bond investors should look critically at traditional benchmarks, using California as an example. Municipal bond benchmarks are flawed. They're debt-weighted, which means the largest index constituents represent the biggest issuers of debt, not the most profitable opportunities. Unfortunately, many municipal bond ETFs try to replicate benchmarks with this flawed methodology, limiting income and return potential. California's bonds are an example of a flawed benchmark approach. California is a big state and large issuer of bonds that make up a significant portion of national municipal bond indices. 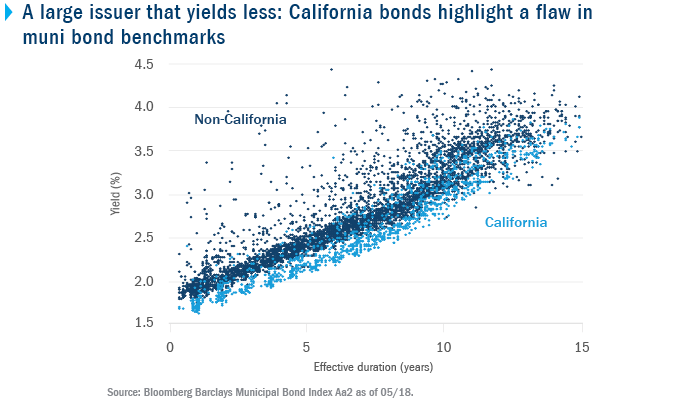 However, they yield less than non-California bonds for any given level of duration. Benchmark-tracking ETFs have a high exposure to California and are missing opportunities for yield. Duration measures the sensitivity of bond prices to changes in interest rates. Bonds with a higher duration experience greater price volatility from interest rate movements. The Bloomberg Barclays Municipal Bond Index is an unmanaged index that is considered representative of the broad market for investment grade, tax-exempt bonds with a maturity of at least one year. It is not possible to invest directly in an index.